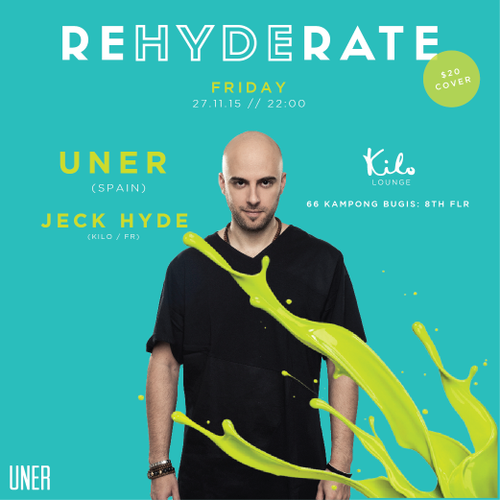 Since his debut in Diynamic in 2009 until his Newcomer DJ Award in 2013, UNER has doubtlessly had the time of his life. After a whole life devoted to music, the reward comes in all levels, gigs all over the globe and his music released by the best electronic music labels; he’s a regular at labels like Visionquest, Cocoon, Cadenza, Cécille or Diynamic, the label which has released on 2014 his debut album, “432”, the most personal view of a UNER that loves house, techno, melodies and vocal harmonies, a work that shows the ripeness and grace status of this Dj and producer and has been very well received among audience and critics. Year after year many things are happening in UNER’s life, he reaches outstanding positions in the most important Resident Advisor tops, he wins DJ Awards as best newcomer and Vicious Award as artist of the year, he gets sponsorship deals with top brands as Native Instruments, Burn or Adidas. The followed path was great but UNER’s ambition makes everything accomplished just the starting point for the next step. The results are at display, as much in Ibiza, where he actively takes part in important parties like Ants (Ushuaia) or Carl Cox The Revolution (Space), as in the rest of Europe (being a regular at clubs like Berlin’s Watergate or at festivals like Sonar) and in America, where he tours both North and South on an ongoing basis.